MERCATOR,G./ HONDIUS,J. - Irlandiae Regnum. Irlandiae Regnum. - MERCATOR,G./ HONDIUS,J. Map maker : MERCATOR,G./ HONDIUS,J.. Size : 13.3 x 18.3 inches. / 33.9 x 46.6 cm. 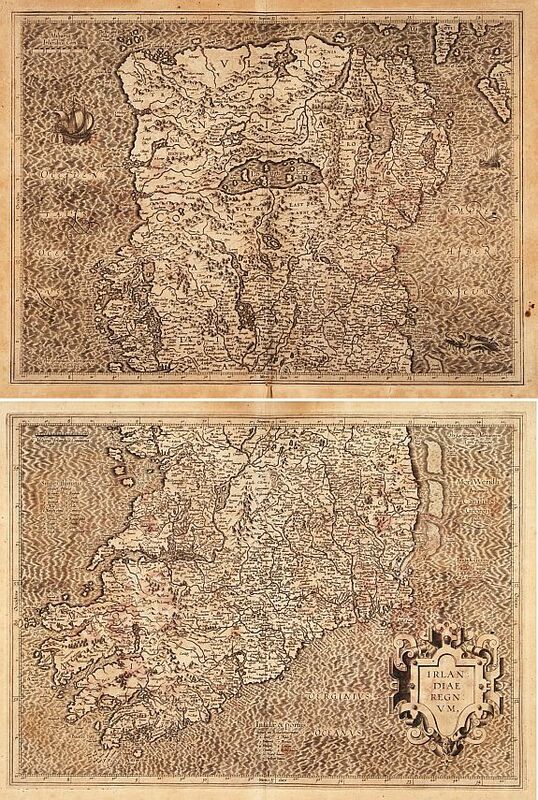 Description :Two fine and early separate maps of southern and northern part of Ireland, can be joined. Mercator was born in Rupelmonde in Flanders and studied in Louvain under Gemma Frisius, Dutch writer, astronomer and mathematician. The excellence of his work brought him the patronage of Charles V, but in spite of his favour with the Emperor he was caught up in the persecution of Lutheran protestants and charged with heresy, fortunately without serious consequences. No doubt the fear of further persecution influenced his move in 1552 to Duisburg, where he continued the production of maps, globes and instruments. Mercator's sons and grandsons, were all cartographers and made their contributions in various ways to his atlas. Rumold, in particular, was responsible for the complete edition in 1595. The map plates were bought in 1604 by Jodocus Hondius who, with his sons, Jodocus II and Henricus, published enlarged editions which dominated the map market for the following twenty to thirty years. Condition : A set of 2 maps. Paper slightly browned, as usual. A good and strong impression.